The son of grocer William and wife Emma Hitchcock, the Master of Suspense was born in London on August 13, 1899. Young Alfred Joseph attended St. Ignatius College before his cinema foray as a title designer. Hitchcock's first completed film was 1925's The Pleasure Garden, followed by over a dozen silents until the director's initial talkie Blackmail in 1929. The 1930s were a budding time for him, both in terms of sowing the seeds of his work in general...as well as discovering and beginning to hone his skills at cultivating terror and suspense. By 1939, Hitchcock seemed more than ready for a change and he accepted a lavish offer from producer David O. Selznick to relocate to the United States. The start of a new decade ushered in his first American movie: 1940's excellent Rebecca starring screen greats Laurence Olivier and Joan Fontaine. Based on the classic Daphne du Maurier story of a woman living in the shadow of her husband's former wife, Rebecca not only won the Academy Award for Best Picture...it remains one of Hitch's artistic triumphs. From then on, Hitchcock's creative reaches were virtually non-stop. In the first half of the '40s alone, he gave us 1941's paranoia laced Suspicion (also with Fontaine), 1943's psycho-in-the-family thriller Shadow of a Doubt (one of the director's preferred films) as well as the effective John Steinbeck-penned Lifeboat (1943). The latter half of the decade was no less successful. The director's 1945 psychological thriller Spellbound is a terrific mood piece with superb performances from Gregory Peck and Ingrid Bergman. Bergman returned the following year for Hitchcock's enjoyable spy terror Notorious. Co-starring Hitch leading man Cary Grant and boasting a wonderful bittersweet ending, Notorious still lays claim to one of the director's best moments: the tracking in shot to Bergman's hand... clutching that forbidding cellar key. Next up were the Technicolor years. And a fresh beginning for the director. Starting his own production company (Transatlantic Pictures), Hitchcock inaugurated this new phase by creating 1948's single set staged Rope. Beautifully shot in subdued hues and featuring expertly mounted suspense, Rope may have been a studious experiment in filming techniques - but it ultimately remains one of the most underrated entries from the director. Hitchcock's zenith climbed even higher with the 1950s. 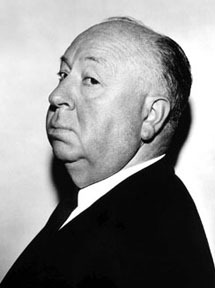 His hit television series Alfred Hitchcock Presents (1955-1965) featured the director introducing various thriller stories with his trademark black humor. And still he found time to make some of the best films of that decade, including the superior thriller Strangers on a Train. Poor Farley Granger meets psychotic Robert Walker...and to avoid suspicion, each man agrees to murder a nuisance in the other's life. But what Granger believes is intellectual posturing, Walker takes to deadly reality. 1954 was a banner year for Hitch. He crafted both the adept murder vehicle Dial M For Murder (those scissors!) as well as unveiling his best film up to that point: the flawless Rear Window. A tour de force of obsessive voyeurism, hacking suspicion and stunning staging, Window remains a picture perfect achievement from its easygoing beginning to its harrowing climax. 1958's Vertigo is perhaps one of the most discussed of Hitchcock's works. Starring James Stewart and Kim Novak, the film is a haunting ghost love story like no other: beautifully manipulative, visually provocative...and strangely degenerative. It's possibly no exaggeration to suggest that by the '60s, Hitchcock was able to do whatever he wanted. So he made PSYCHO (1960). A low budget horror film using the same production crew from his TV show, PSYCHO was as a much a technical whim as a black humor joke told by the director. And yet the result was a powerhouse terror ride...the true beginning of the slasher subgenre. Hitchcock followed his splatter fun with 1963's nature amok classic The Birds. He had been directing for over forty years...but had lost none of his prowess. A spirited disaster terror buoyed by technical effects mastery, The Birds is a winged frenzy that belongs in the top echelon of Hitch's efforts. After potentially the most distinguished artistic career by a director in film, Hitchcock died in 1980. His work has been praised, analyzed, debated, deconstructed, dissected, imitated, reworked, critiqued...but most of all it's been adored and appreciated. When all is said and done, nothing alters the fact that Alfred Hitchcock was one of the most brilliant and influential filmmakers bestowed on the world of cinema. His legacy is simply staggering.